Rescued when he was about 8 weeks old, the orphaned beaver now lives with Brigette Brouillard of Second Chances Wildlife Center in Kentucky. Justin Beaver is a very busy guy and a dam cute one, too. JB, as he's known, was orphaned last summer when he was about 8 weeks old. Now he lives with wildlife rehabilitator Brigette Brouillard, the 45-year-old founder and director of Second Chances Wildlife Center in Mt. Washington, Kentucky. 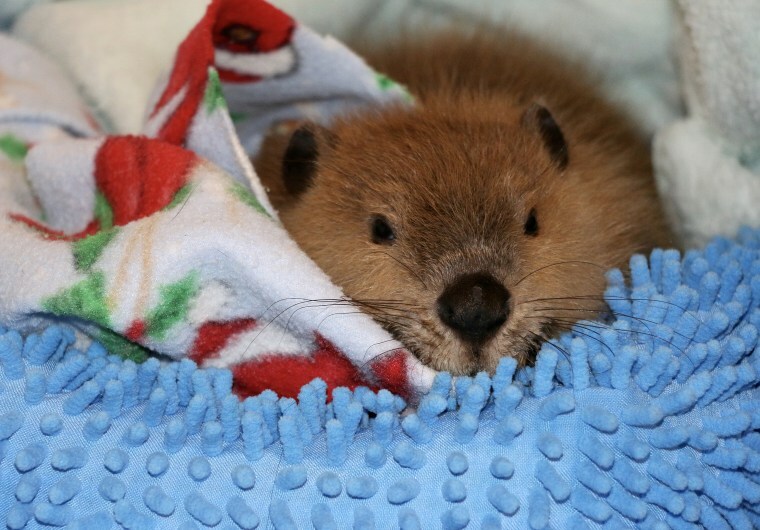 Watch this rescued beaver build himself a dam out of bath mats and toys! And Brouillard's best description of JB: "He's a ham." JB was orphaned so young that he doesn't really know how to be a beaver. So he can't be released into the wild. Instead, he's licensed by the federal government as an "educational animal." That means he'll stay permanently with Brouillard, and go with her to places like schools and libraries to help teach people about wildlife. But Justin Beaver didn't need to be taught how to build dams. Around September, he started building them in Brouillard's house using any materials he could get his paws on: bathroom mats, shoes, even Brouillard's laptop one time. "He builds dams regularly," Brouillard said. "He just gathers whatever he can find." Some of JB's other favorite activities are a nice nod to his namesake, pop singer Justin Bieber. He croons adorably when he sees Brouillard open the refrigerator, because he knows a treat is coming — sweet potatoes and kale are his top snacks. Justin Beaver also enjoys combing his glorious fur using the two claws on his hind feet that serve as a sort of built-in hairbrush. When Justin Beaver sleeps, "he puts a big wad of fleece blanket in his mouth and holds the blanket with both of his hands. It's like a baby with a thumb or pacifier," Brouillard said. And it's especially cute when JB hangs out in the bathtub, drinking from the tap (and also peeing and pooping there, since beavers do their business in water). Brouillard jokes that she has the cleanest tub in town, since she's always scrubbing it down. Justin Beaver's other favorite and possibly slightly less endearing activity is ripping up the walls of Brouillard's house, as well as tearing apart furniture and paper goods. "It's just kind of like having a toddler, only more destructive," Brouillard said. Brouillard cares for about 250 animals per year at Second Chances. These include bats, squirrels, opossums, skunks, foxes, groundhogs and other mammals. Four animals live in the house: JB and three other educational animals — an armadillo, and two skunks — who can never be released. But Justin Beaver needs a bigger body of water; and he needs more of his own space. So Brouillard is currently raising money to build him a special enclosure with its own private, 6-foot-deep — and really well-filtered — pond. Brouillard hopes to have Justin Beaver's sweet crib ready in the spring. JB will still have lots of company even then, since he is so well loved, and also because of his job as an educational animal. But the enclosure will be full of dam-building materials, as well as lots of toys to keep JB mentally stimulated when he isn't with people. Of course Brouillard imagines the house will feel a little empty once Justin Beaver's moved out, like the absence of his "cute little expressions and his adorable noises." She added: "Oh, I do love when he sits on his tail, too. I'm sure I will miss him — not necessarily the stress of having a beaver in my house."